On October 22, the Minister of Education introduced Bill 122, School Boards Collective Bargaining Act, 2013. This new legislation focuses on a formalized bargaining model for Ontario’s education sector. Following the 2012 bargaining process, the government committed to introducing legislation that would enshrine a new bargaining framework for the education sector. OCSTA has been very active in the consultation process leading up to this new legislation. The Association submitted to the government key content and advice for this framework and advocated strongly for an effective leading role for Ontario’s school boards in the labour negotiations process. The positions presented by OCSTA were derived from the feedback provided by our member boards through various discussion sessions hosted in January and March of this year. We are pleased to see that the trustee associations are designated in the legislation as the official employer bargaining agents. This designation means that the trustee associations will have the authority in labour matters to represent school boards at the central table; to exercise the rights of the employer under the Labour Relations Act; and to bind boards to a collective agreement, though internal ratification is necessary for an agreement to be final. It is important to note that the trustee associations will be responsible for central bargaining with teachers in their respective sectors, and that the protection of denominational and linguistic rights is upheld in the new legislation. This new law is currently under debate in the Legislature. 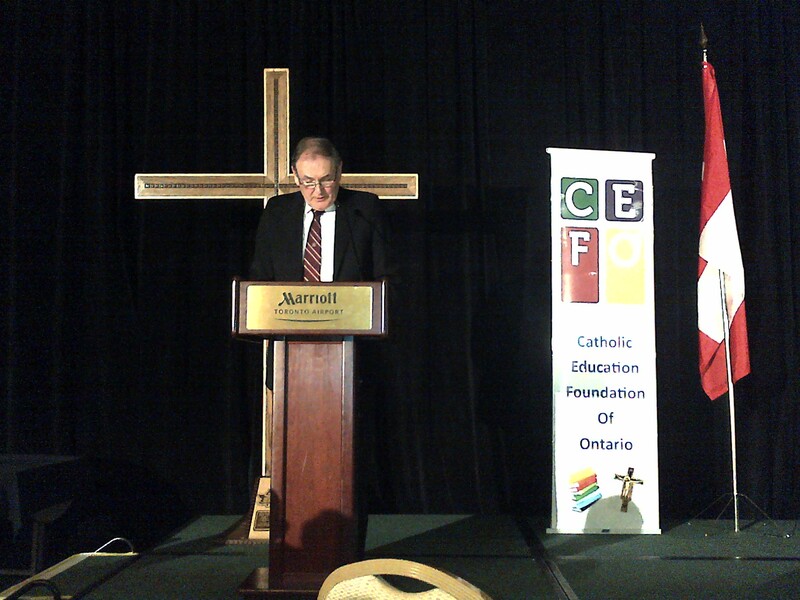 The Catholic Education Foundation of Ontario (CEFO) Medal of Honour is annually awarded to a person or a group who has demonstrated, on a province-wide basis, a major contribution to Catholic Education in Ontario. OCSTA is pleased to announce that this year’s CEFO Medal of Honour recipient is our very own Director of Catholic Education, Noel Martin. This award aptly recognizes Noel’s outstanding career as an educator and system-wide leader for Catholic education. Congratulations! As announced in previous weeks, at the end of October Noel will be retiring from his position at OCSTA. We wish Noel and his wife Joan much happiness always. 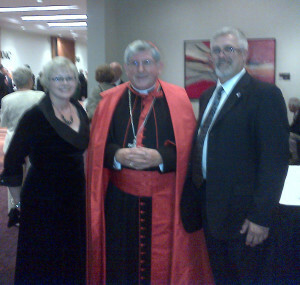 OCSTA President, Marino Gazzola (r.) and wife Laurie with Cardinal Thomas Collins. For 34 years Catholics in the Archdiocese of Toronto have gathered annually for an event that raises much needed support for local charities. The widely respected Annual Cardinal’s Dinner typically welcomes 1,600 guests for an evening of fellowship and recognition of the work of the Church in the community. 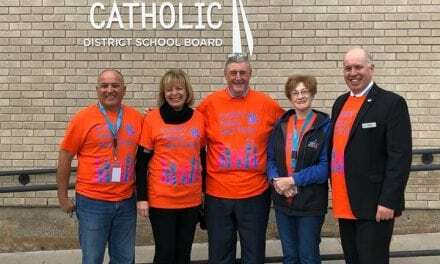 The event was held this year on October 17 at the Metro Toronto Convention Centre and was attended by many members of the Catholic education community including OCSTA President, Marino Gazzola, his wife Laurie, OCSTA’s Executive Director, Kevin Kobus and his wife Susan. The event also annually welcomes various public officials and this year’s event included the Premier of Ontario, Kathleen Wynne, opposition leaders Tim Hudak (PC Party) and Andrea Horwath (NDP Party). The Federal Minister of Finance, Jim Flaherty, was at the head table as were Rob Ford and Hazel McCallion (the respective mayors of Toronto and Mississauga). “We often hear that the Church is not growing. While that is a reality in some parts of the country, our experience is quite the opposite. We have opened a large new church every year for the past decade, and we have three more in preparation. Consider that 10 of the 50 most populated cities in Canada are located in the geographic boundaries of the Archdiocese of Toronto. These communities grew by a collective total of more than 400,000 residents from 2006-2011. It would be akin to inserting the entire population of Halifax into the Greater Toronto Area. All in all, we are a spiritual family of approximately 1.9 million Catholics. We celebrate Mass in more than 30 languages every week, making us one of the most ethnically diverse faith communities in the world. …Each parish needs to be a home of prayer, love, and service. We are also blessed in our archdiocese with publicly funded Catholic schools. The three facets of family, parish, and school are fruitfully linked in the whole educational formation of young people. Parents, priests, and educators join together in serving them. To read Cardinal Thomas Collins’ full address click here. 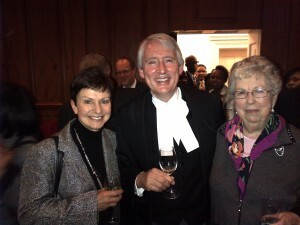 Peter Lauwers with OCSTA’s former Director, Legislative and Political Affairs, Carol Devine (l.) and OCSTA Past President, Betty Moseley-Williams. The annual January professional development seminar for Catholic trustees will take place January 17-18, 2014 at the International Plaza Hotel (formerly known as the Doubletree). We’re pleased to inform members that the final module in the Trustee Training program – Module 11: Conflict of Interest – will be presented at our January Seminar and will be discussed by The Hon. Justice Peter Lauwers, Ontario Court of Appeal. Prior to Justice Lauwers’ judicial appointment he practiced law with the firm of Miller Thompson and was OCSTA’s legal counsel for several years. To view the preliminary program and register for this event please visit https://www.ocsta.on.ca/2014-catholic-trustees-professional-development-seminar/. The Catholic Board Council of the Ontario Student Trustees’ Association has asked for the Association’s support of an innovative and historic initiative. The success of this initiative depends on the cooperation and participation of all Catholic school boards in the province. Our Catholic student leaders have established as their goal for this year, the simultaneous celebration of the Eucharist among all secondary school students in every Catholic school board, province-wide. This special Mass would be organized by each secondary school and held locally at a location of the school’s choice. After consulting with OCSTA and the Assembly of Catholic Bishops of Ontario (ACBO), the Catholic Board Council has decided that the Province-Wide Mass will take place on May 7, 2014. The Province-Wide Mass will serve as a wonderful unifying activity to enhance Catholic Education Week. This student lead initiative also includes a very special original component to this event: the students have extended an invitation to Pope Francis to share a unique message with the students of Ontario in recognition of this historic province-wide event. In their invitation to the Holy Father, the students also made note of an interesting fact: Ontario’s Catholic school system is the largest publicly funded Catholic school system in the world. 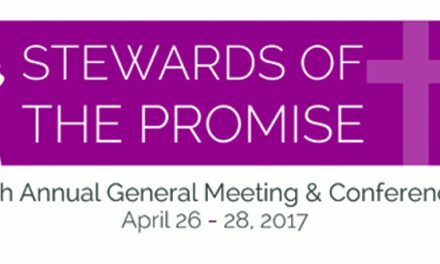 A memo from OCSTA’s president, Marino Gazzola was sent to all boards encouraging their participation in this effort. Now would be the time to ensure that the date for mass (May 7, 2014) is included in your calendars and shared with your parish pastors. Further details on this Catholic Board Council project are included in this backgrounder. On behalf of the Catholic Board Council of the Ontario Student Trustees’ Association – l’Association des Eleves Conseillers de l’Ontario, OCSTA would like to announce the 13th Fall General Meeting for this provincial student group taking place November 14-17th, 2013 at the Toronto Marriott Downtown Eaton Centre, 525 Bay St., Toronto. The Catholic Board Council (CBC) president, Madeline Ellepola (Windsor-Essex Catholic District School Board) invites all Catholic student trustees to attend this event. The Catholic Board Council membership is comprised of every Catholic Student Trustee who is a member of OSTA-AECO. The Catholic Board Council will be meeting during this Fall General Meeting to discuss the distinctive initiatives being planned by Catholic student trustees for students in the Catholic school system. For more information you can download the FGM package at http://osta.aeco.org. TORONTO – The province’s powerful and often vociferous teachers unions have been unusually silent since Education Minister Liz Sandals unveiled her highly anticipated “sweeping reforms” to collective bargaining earlier this week. The new School Boards Collective Bargaining Act, which Sandals tabled Tuesday, makes an absolute mockery of the idea of reform. The legislation not only guarantees that teachers unions will continue to call the shots in Premier Kathleen Wynne’s Ontario. It does nothing to prevent the next round of collective bargaining with teachers unions — slated for next year — from being a repeat of the last school year in Ontario when dissatisfied teachers cut after-school activities and extra help and in far too many cases brought their militancy into the classroom. In fact, this legislation does quite the opposite. Wynne and Sandals, had they had the concerns of taxpayers and not their own self-interests in mind, could have seized on the opportunity to make teachers an essential service — and to ban their right to strike. Robert Murray, who’s just left his position as director of legislative and political affairs for the Ontario Catholic School Trustees Association, said this was a “perfect opportunity” for the Wynne government to show leadership and make teachers an essential service. “That would prevent teachers from using students as leverage in matters of labour disruption,” said Murray, now vice-president of research with the western-based Frontier Centre. “Until a party really has the courage to do that … it almost encourages the unions to be able to drag students into it … They know it will immediately get the attention of the government. It’s more than lacking courage to make hard decisions. Murray said it’s all about being beholden to the teachers unions which have contributed with impunity to the Liberal party to keep the Grits in power over the last 10 years. “While there was money, everything was hunky-dory — but once the government’s coffers are empty, they need to do everything to keep their friends, their friends,” he says. EFTO President Sam Hammond would only say in a statement that they want to “conduct a thorough review” of this “unique and complex” legislation before commenting. 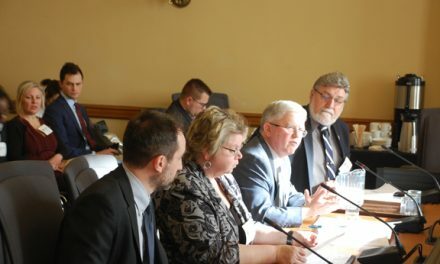 But Sandals insisted the new legislation is “dramatically different” from previous collective bargaining laws because the new bill will allow provincial trustees and school board associations to be “legally” at the bargaining table. She insisted the Education Relations Commission still has a role to advise the government when any school year is in jeopardy if a strike goes on for too long. Hmmm. Sounds to me like the definition of a good school climate is giving away the candy store to teachers. PC education critic Rob Leone said it’s clear that the Liberals are trying to “repair a damaged relationship” with the teachers unions. We already know that as soon as the ink was dry on her appointment as premier this past February, Wynne re-opened deals with the Ontario Secondary School Teachers Federation (OSSTF) and the Elementary Teachers’ Federation of Ontario (EFTO) to buy labour peace. As revealed in this space last month, Wynne’s peace deal, together with the me-too clauses in the other three teacher union and CUPE worker agreements, could end up costing taxpayers an extra $500-million. Dufferin-Peel Catholic District School Board trustees said they are outraged with Ontario Education Minister Liz Sandals for showing little or no interest in meeting with local board members. October 2, 2013 -PEEL— Catholic school board trustees said they are outraged with Ontario’s education minister for showing little or no interest in meeting with local board members. One after another, Dufferin-Peel Catholic District School Board trustees publicly vented their frustration with the minister during a recent board meeting. Trustees took offence to a letter from Education Minister Liz Sandals sent in response to school board requests for a meeting on local issues. Trustees considered the six-line letter, addressed to Board Chair Mario Pascucci’s administrative assistant, insulting and dismissive. “While I regret that I am unable to meet with Mr. Pascucci at this time, the request will be kept on file for consideration at a future date if I am travelling in your board’s area,” Sandals said in the letter. Pascucci said he and his assistant had attempted “countless” times by phone and mail to reach the minister with the board’s request for a meeting. Dating back to 2006, previous education ministers, including Gerrard Kennedy, Sandra Pupatello and current Premier Kathleen Wynne, have all taken time for a face-to-face meeting with board members, pointed out Mississauga Trustee Peter Ferreira. 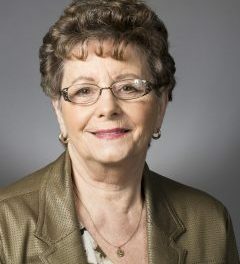 When Wynne was education minister she met with the board three times in one year, according to Pascucci, who noted Sandals’ constituency is in neighbouring Guelph. She could be travelling in the Dufferin-Peel area on her way to and from work, he suggested. “I’m happy to meet her at a Tim Hortons on the (Hwy.) 401,” Pascucci remarked. Trustees are not only angered, but also nonplussed Sandals, a former school board trustee, would treat trustees in this manner. The board agreed to express their disappointment and frustration in a letter to the premier. “The irony of all this is she (Sandals) has asked for consultation,” said Pascucci. This past spring similar frustrations with Sandals, who was appointed education minister by Wynne in February, were voiced by the Peel District School Board after unsuccessful attempts were made to meet with the minister. Sandals eventually met with Peel board officials. That fact has not gone unnoticed by local Catholic school trustees and makes her unavailability for them all the more stinging. Ramey added the minister would be glad to meet with local board members the next time she visits the community. Furthermore, ministry staff are always available to meet with school boards about any issue, she explained. MPP Lisa MacLeod’s bill would revoke widely criticized Regulation 274, created to combat perceived nepotism in hiring. A private member’s bill to be introduced Wednesday would kill a rule that forces Ontario principals to hire teachers with the most seniority, and instead require boards to have fair hiring policies approved by the province. The Tory bill would return to principals the power to hire the teacher they want for long-term and permanent positions, and not simply from a list of five occasionals who have worked the longest — as they must under Regulation 274. Meanwhile, the Star has also learned that Education Minister Liz Sandals is going to launch a study on the impact of Regulation 274, in addition to the working groups she has created with concerned teacher unions. Regulation 274 was brought in because of concerns raised by the Catholic teachers’ union about nepotism. The regulation is opposed by every other teacher union, by school boards and the deans of Ontario’s faculties of education, who argue it prevents new grads from getting jobs and will hamper efforts to improve diversity. Even teachers with years of seniority have been affected by the changes, because when they switch boards their experience no longer counts. Merritt Blundy, who taught for six years in the Peel board before getting married and moving to the Waterford area, found herself sitting at home on the first day of school this fall. Last year, she was able to land a long-term assignment with the Grand Erie board, but under the new regulation all she can get this year is the odd supply job. She’s even considering returning to Peel next year and bunking with family during the work week. “Teaching is a wonderful career because of its variety — you might take on an early literacy role, maybe become a phys. ed teacher or a vice-principal one day, but I never thought I would be a supply teacher after I’d earned a permanent position,” she said. Grandfather Charles Wakefield, who volunteers at Toronto’s Rose Avenue Public School, said the parent council there is reaching out to other councils to lobby the government to rescind the regulation. Both the Ontario Public School Boards’ Association and its Catholic counterpart are also pushing for change. He said boards, for the most part, already have transparent hiring policies in place, but this would force all of them to do so, and get the ministry’s approval. Nominations are now open for the prestigious Toronto Catholic District School Board Alumni Award and the TCDSB Award of Merit. Deadline: January 17, 2014. Winners will be honoured at our Annual TCDSB Awards Night Gala, which is the highlight of the Board’s Catholic Education Week celebrations on May 5, 2014 (7 p.m.). TCDSB Alumni Award: is presented to accomplished alumni of the TCDSB who were students in a Toronto Catholic District School Board school, who are still active in the Catholic community and who have distinguished themselves in their career or accomplishments. The recipients will be chosen from diverse areas of career and endeavour. 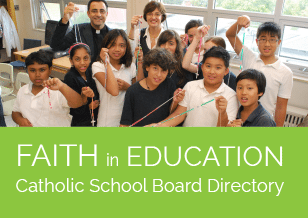 Current TCDSB employees and trustees are not eligible.